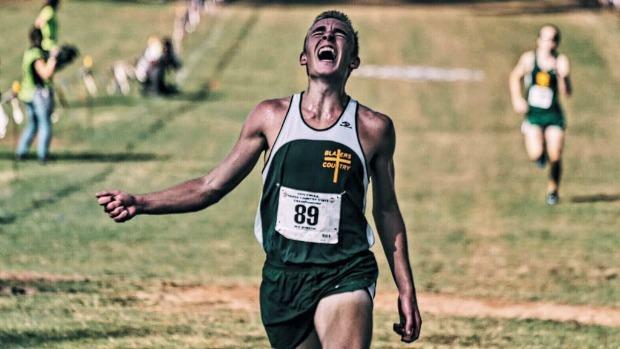 The Class A meet at Apalachee Regional Park in Tallahassee saw a changing of the guard for both genders. On the boys side, Melbourne's Holy Trinity won the last three titles and Winter Park's Trinity Prep (now in Class 2A) won in 2010, 2009 and 2007. One has to flip the calendar all the way back to 2003 to find a Class A boys state title won by someone besides Holy Trinity and Trinity Prep. That all changed Saturday as Daytona Beach's Father Lopez is the new Sheriff in Class A. 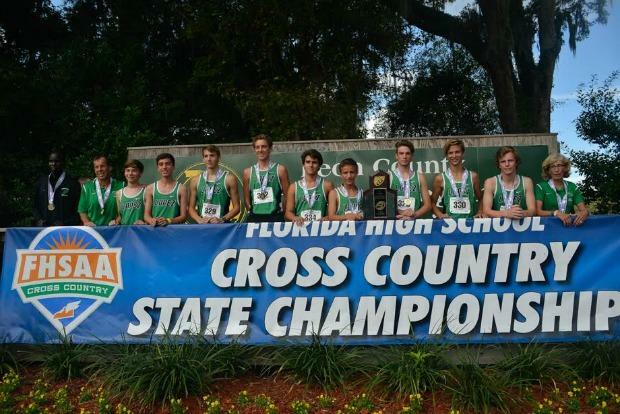 The Green Wave out scored defending champ Maclay 118 to 132 and they did it without a single runner in the top 15. The first Green Wave runner to come in was Noah Van der Burgt in 25th but the rest of the team packed in close around him. Nicolas Theriault was 30th, Chase Massi was 32nd and Matthew Roof was 39th. "On paper, they (Maclay) had better times but we had a better average and at the state level, that's what you want," Green Wave coach Sue O'Malley said. 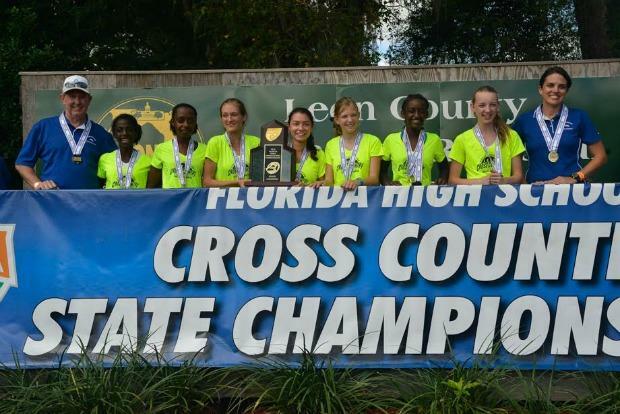 "Four years ago, we discovered some committed runners and we made a pact that by their senior year, we were going to win a state title." Those seniors are Theriault, Roof, Massi and Nick Ohlwein and they helped deliver the first state, district and regional cross country titles in school history. "We were ranked seventh in pre season but we put it all together," O'Malley said. The boys Class A race was stocked with high drama as well. Top-seeded Noah Perkins of Seffner Christian elected to make a go of it in the race after pacing the regional meet in a walking boot. Perkins suited up for the race but on a short practice week and a tender foot. Perkins could only work in the pool, leading up to the meet. 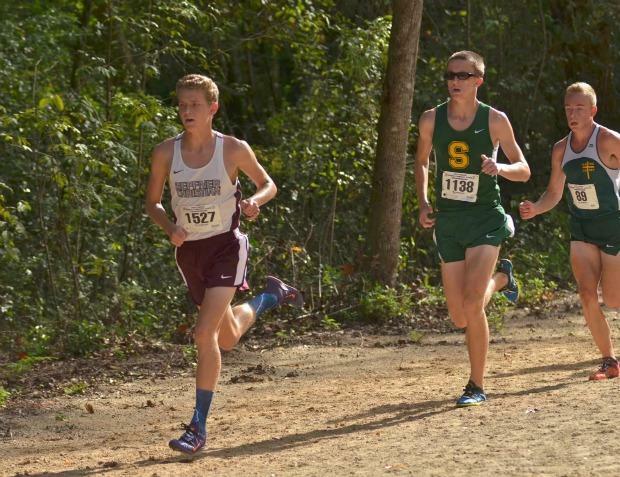 Still, it was Perkins, Shorecrest's Luke Peterson and Tucker Hindle of Boca Raton Christian School out in front. The course at Apalachee Regional Park is a cross country runner's dream. It takes off over undulation grass hills before turning to the left and coming down a sand and crushed shell runway that marks 1.5 miles runners then head up, "The Wall", a formidable hill before turning left again and coming back down through the starting area. One more trip around and the course completes it. After the first trip over The Wall, Perkins moved into the lead. "We went out fast and I tried to stay in fifth not knowing what would happen," Perkins said. "Then into the first hill, I took the lead." Around for the second loop, just past the 2.5-mile mark, Perkins started to fade. It became a duel between Peterson and Hindle. Second trip over the wall, saw Peterson take the edge but Hindle took it back down the last straightaway and held all the way down the grassy slope to the finish in 15:56.01. Peterson was just a few seconds behind at 16:02.55 and Perkins gutted out a third place finish in 16:28.89. "This has been a goal since my freshman year," the senior Hindle said. "I worked a lot of downhill practices for this meet, a lot of sprints and I use my turnover and that can sometimes beat a longer-legged runner." Hindle announced that he had verbally committed to Lee University in Tennessee. "Tucker ran a great race," Peterson said. "He kept pushing it up the wall and I couldn't go with him, I was just done." On the girls side, Orlando's Circle Christian out-paced Tallahassee's Maclay. Holy Trinity and Gainesville's Oak Hall had won the team title four of the last five years. The Centurions reset the meter, out-distancing Maclay 101-146. "We were second among 1A teams at Pre State and that started our confidence that we could be here today," Circle Christian coach Mark Caufield said. "We were 11th last year, so this is a big step up for us." It was the Centurions first cross country title and second of the season after winning a bowling title this fall. Seventh-grader Sinkenesh Parker led the way for the Centurions, placing 10th overall in 19:39.10. 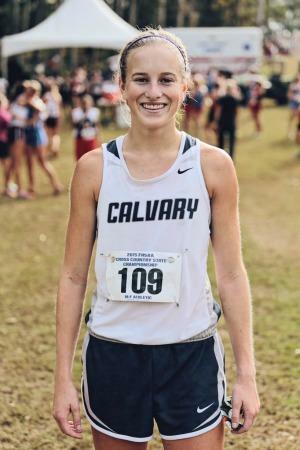 Then senior Karah Hammontree grabbed 14th in 20:02.14. 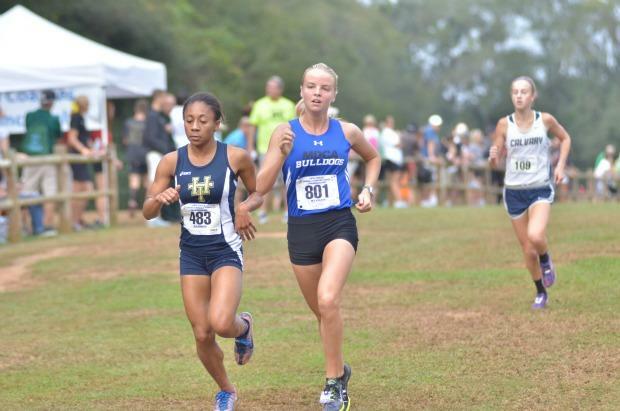 Individually, Mount Dora Bible's Rebecca Clark, Holy Trinity's Shelby Smith and Grace Blair of Oak Hall and Clearwater Calvary Christian's Hannah Brookover got out to an early lead and through the first 1.5 miles, put four seconds on the rest of the field. Over The Wall the first time, Brookover moved into third and coming down the grass straightaway, Brookover moved into third as Smith dropped back. Back through the sand and shell, near the 2.5-mile mark, Brookover moved into second behind Clark and the duo put 14 seconds on the rest of the field. Over The Wall for the second time, Brookover made her move. "I wasn't expecting them to go out that fast, I knew I didn't want to go out that fast," Brookover, who had a 5:30 split on her first mile, said. "But when I saw them slow at the first hill I decided try try and get past (Clark) on the second hill." Brookover broke the tape at 18:31.89 and Clark was hot on her heels in at 18:33.86. "I wanted to take it out fast and hopefully lead the whole way," Clark said. "I felt Shelby (Smith) fall off and then I took off but I couldn't catch her (Brookover)."